Trucking accidents are among the most devastating types of motor vehicle accidents. According to the Federal Motor Carrier Safety Administration, there are an average of 11 truck accidents on American roads every day. These catastrophic accidents claim 4,000 lives each year and injure another 100,000 people. If you have been hurt in a semi-truck crash, or you have lost a loved one in a trucking accident, you may still be reeling from the aftereffects of being involved in such a serious and life-changing event. During a time like this, the last thing you need to worry about is taking on an insurance company or a commercial truck company. These are complex cases that often involve multiple parties, as well as federal and state law. Without an experienced Washington DC truck accident lawyer on your side, you may not get the money you deserve. Semi-trucks can weigh up to 80,000 pounds. 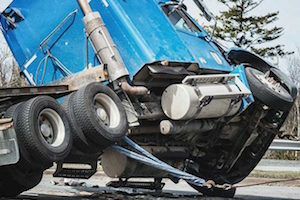 When you consider that the average car weighs somewhere around 4,000 pounds, it’s easy to see why few cars stand a chance in a crash involving a large truck. Unfortunately, many truck companies push their drivers to make deliveries on a strict schedule that is almost impossible to achieve. When commercial carriers place profits ahead of safety, catastrophic truck crashes are often the result. In recent years, distracted driving has also become a serious problem in the trucking industry. Anything that takes a truck operator’s eyes or attention off the road is a potential hazard that can lead to a devastating collision. Like any other motorist, truck drivers must avoid distractions, such as texting and driving, checking email, eating behind the wheel, or looking at GPS while they drive. The injuries caused by trucking accidents are usually severe. In many cases, victims suffer injuries to the head, neck, and spine. The cost of medical care for these types of injuries can easily skyrocket into the millions and rapidly deplete an accident victim’s health insurance benefits. If you have been injured in a trucking accident, you may be entitled to receive money for your lost wages, medical bills, prescription costs, loss of future earning potential, pain and suffering, loss of companionship, loss of quality of life, and ongoing medical expenses. When you file a lawsuit, you have just one opportunity to get the money you need to pay for your long-term medical care. If you fail to ask for enough, or you fail to prove the full extent of your injuries, you could end up with far less than you deserve. This is why it’s important to work with an attorney who regularly handles trucking accident cases. The Washington DC truck accident lawyer at Mesirow & Associates, PLLC can help you get the compensation you need to pay your medical bills, cover your lost wages, and get back on your feet after a serious semi-truck accident. Schedule your free case evaluation today by calling 866-463-0303.